1) Painful Medicine: This (non-wonkish) paper documented that fiscal consolidations not only lower aggregate incomes but have distributional consequences—wage incomes fall more than profits; and the long-term unemployed are affected more than short-term unemployed. 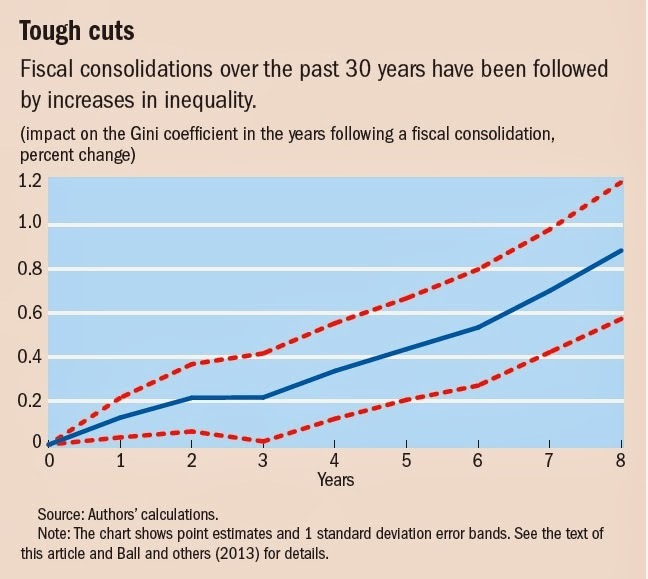 2) The Distributional Effects of Fiscal Consolidation: A wonkish version of the “Painful Medicine” article, with the additional result that, between 1978 and 2009, fiscal consolidations in advanced economies increased the Gini measure on income inequality. 3) Distributional Consequences of Fiscal Consolidation and the Role of Fiscal Policy: In addition to confirming the results in the previous papers, this paper brings in evidence from emerging markets. It also discusses how policies can be designed to mitigate the impacts of fiscal policy on inequality. 4) Who Let the Gini Out? : A (non-wonkish) summary of some of the previous papers. 5) Fiscal Policy and Inequality: A key finding of the paper is that fiscal consolidations during the Great Recession did not lead to increases in inequality.